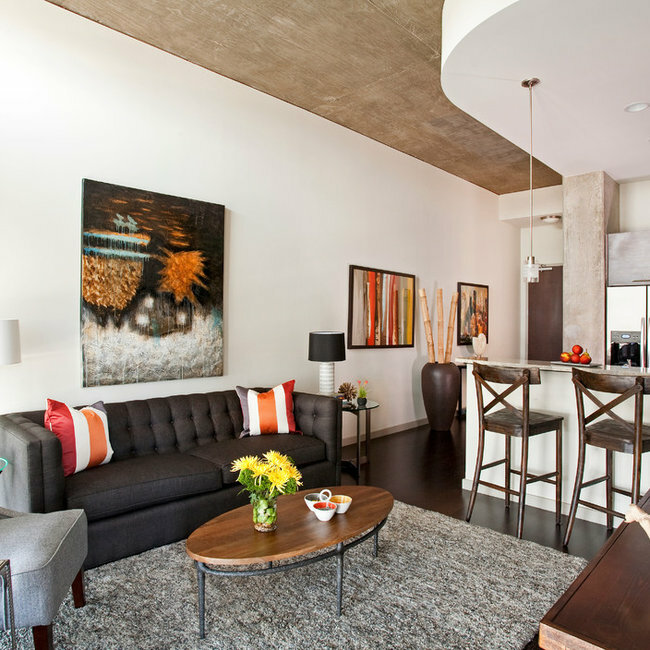 68 photos This project has received (5) various ASID DESIGN OVATION DALLAS AWARDS... In addition to updating their down-sized, 80’s hi-rise condo, this client requested a flexible living space with multi-purpose storage, room to cook and entertain and a luxurious, spa-like environment for the Master Bathroom and Bedroom. 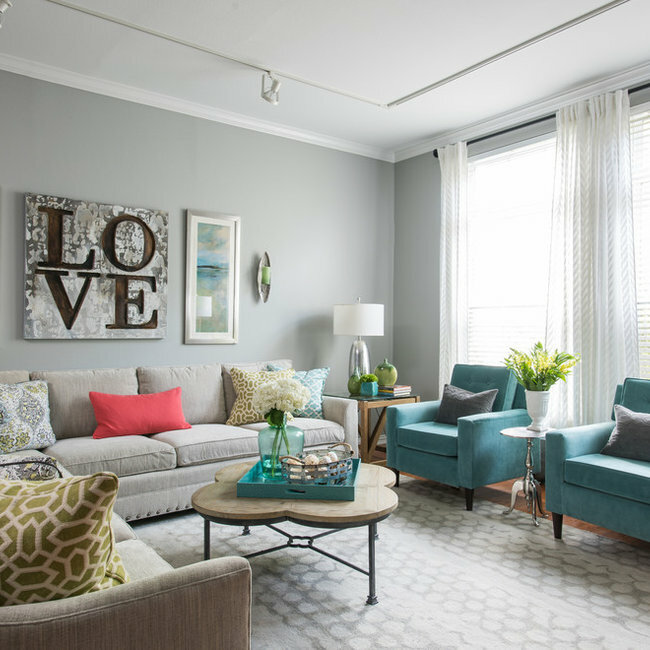 While the entire condo was updated with fresh paint and new flooring, the Powder Room, Kitchen, Master Math, her Office and Laundry Room received complete remodels to improve flow and maximize storage. 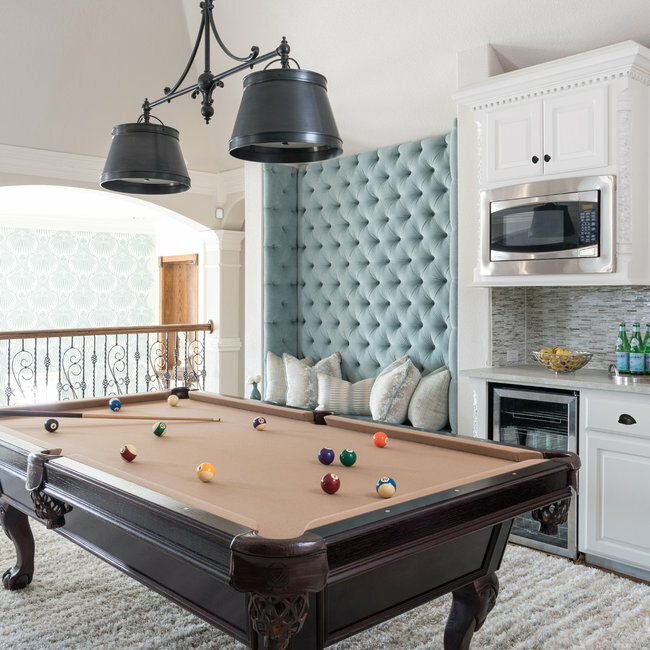 The color palette of aqua, navy and warm gray was selected for the main living area to reflect the client’s love of the Cape. Coordinating schemes flow into the secondary areas. Also See Before Photos below. 13 photos FIRST PLACE MASTER BATH OVER $50,000/ ASID DESIGN OVATION AWARD! In addition to a much-needed update, the clients desired a spa-like environment for their Master Bath. Sea Pearl Quartzite slabs were chosen as the inspiration for this color scheme and used on an entire wall and vanity. The toilet was enclosed and a frosted glass French door installed. The large built-in corner tub was replaced with a free standing 5-foot soaking tub. The narrow shower, left open facing the tub, a linear drain and curb less, as well as frameless glass create a clean open space, showcasing the slab wall. Half columns, designed to allow the controls to be located by the entrance to the shower were tiled in the same iridescent glass mosaic as the back wall of the shower and behind the tub. Additional luxury includes three stunning sconces flanking the mirrors, a crystal chandelier over the tub, the heated tile floor, towel warmers and a heated bidet. 9 photos The client wanted to update their 80’s Master Bedroom which included a very awkward orange brick fireplace located on the outside corner of a notched wall. 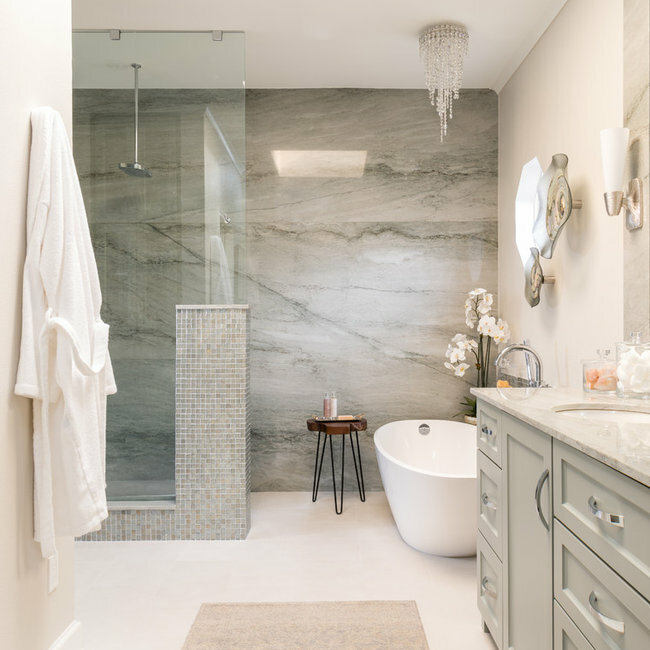 The request was to continue the spa-like environment Dona Rosene Interiors had just completed in the adjacent master bathroom (see Ethereal Bath) into the Master Bedroom. 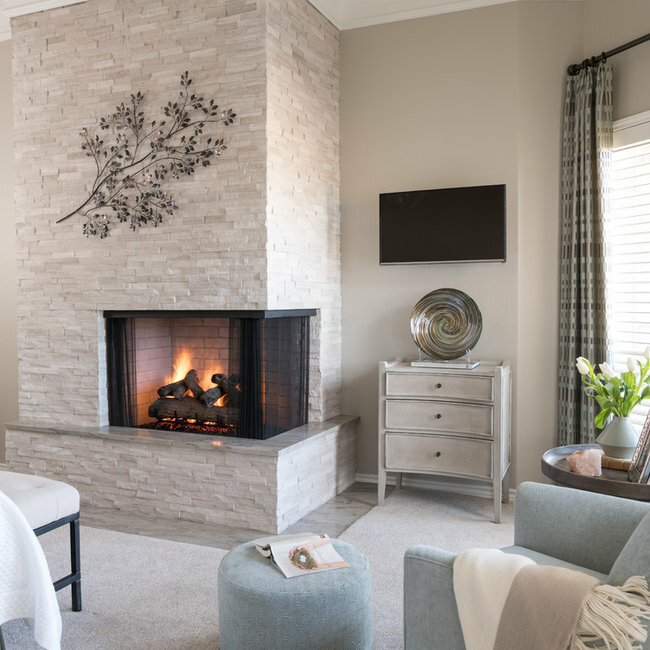 Using ivory stacked stone and sheet rock to cover and create space for the wall mounted TV, the fireplace was transformed from an eyesore to an asset in this ethereal retreat. An elegant, antique silver finished chandelier replaced the ceiling fan. 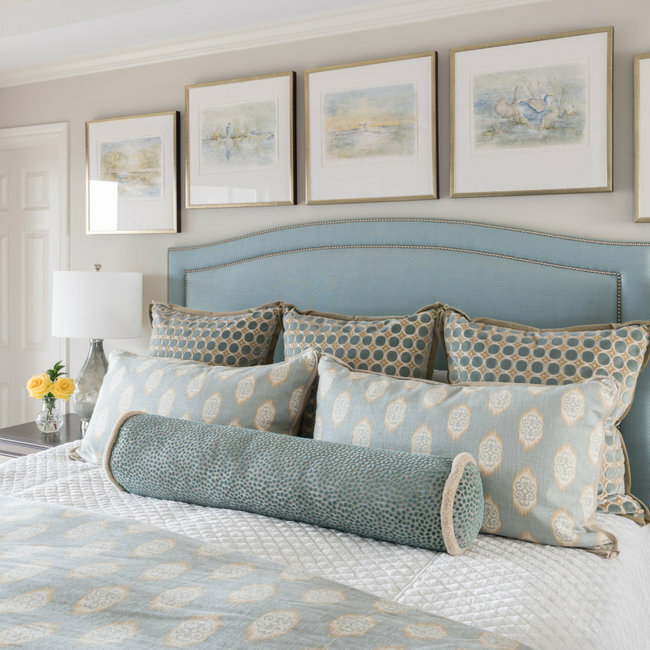 An upholstered headboard & tailored bed-skirt in the ethereal gray green linen compliments the geometric fabric used on the pillows & drapery panels framing the shutters and hanging from a bronze rod. The fixed panels soften the wall of French windows and door as well as creating the illusion of height. A cozy seating area warms up to the fireplace and TV. This homeowner requested professional assistance transforming this small, jumbled room with lots of angles into an efficient home office and occasional guest bedroom for visiting family. Maintaining the existing stained wood moldings was requested and the final vision was to reflect their Nigerian heritage in a dramatic and tasteful fashion. 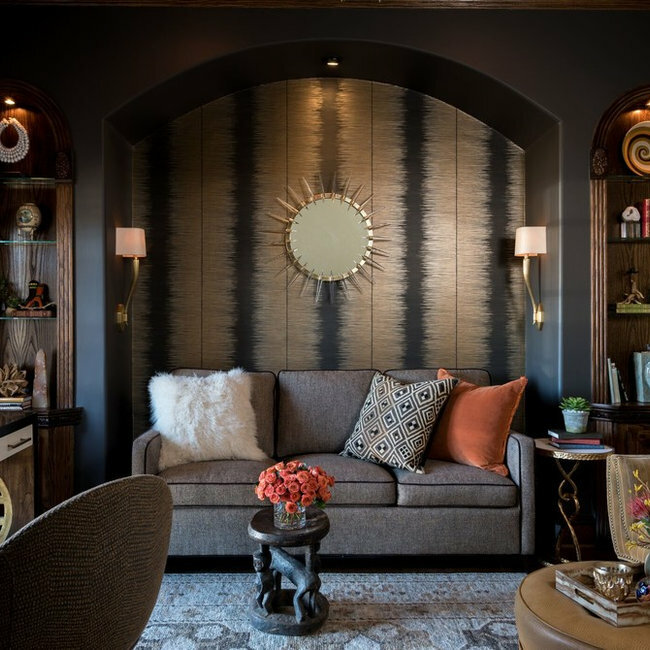 First, the built-in hutch was replaced with a sleeper sofa, dramatic wallpaper and sconces. Storage cabinets were added below the flanking niche shelves and with upper shelves in a dead corner. Office supplies were camouflaged with grass shades on the walk-in closet French doors and this organic texture was repeated on the entry French doors for privacy. Light, color and interest were added with the use of a variety of textures such as the nubby sofa fabric, the African cloth pillows, global accessories, velvet on a striking wing chair with a leather ottoman, as well as a hand-knotted Tibetan rug and a beloved painting by a favorite Nigerian artist. 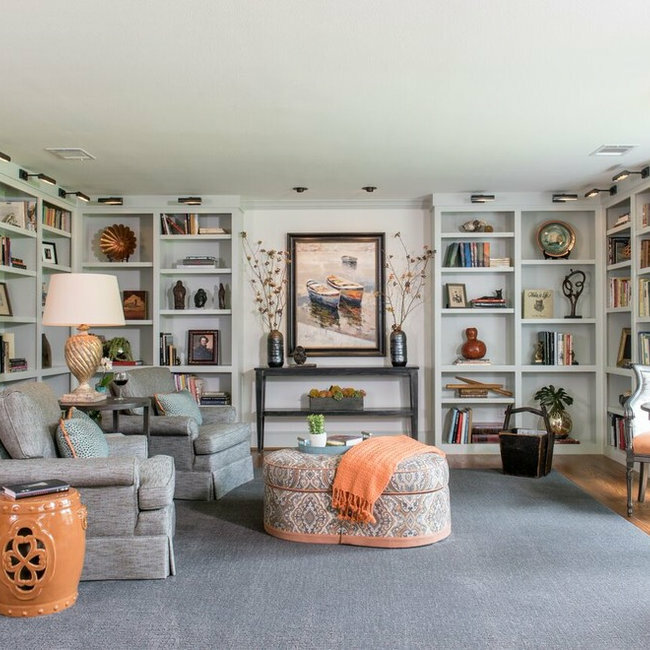 19 photos Great Room Addition and Library- years after a major remodel, this couple contacted Interior designer Dona Rosene as they had for 25+ yrs to work with the contractor to create a Great Room Addition. To warm up the room and bring the ceiling down, wood planks along with 2 large scale iron chandeliers were used. We designed and built a library in what used to be the adjacent TV room. Here the couple’s favorite objects, books, and art surround the comfortable seating area for reading and conversation. In the beautiful window a spot was created for the couple to enjoy breakfast overlooking the backyard . 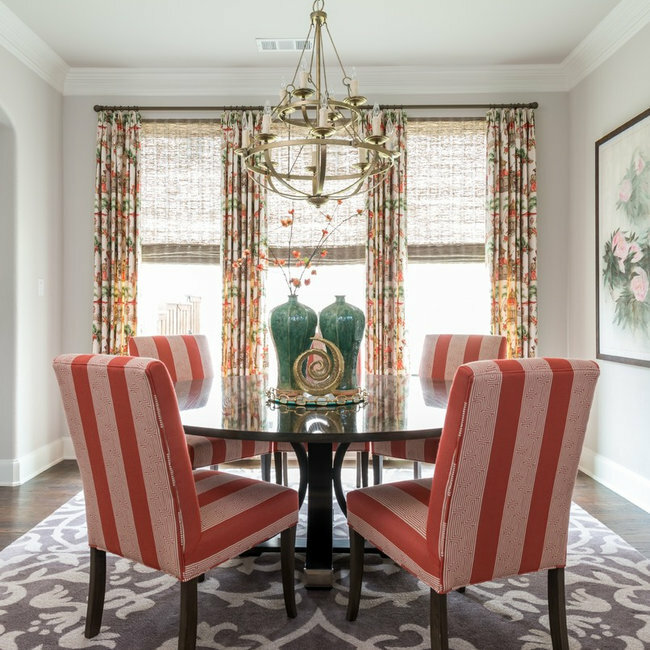 18 photos Dona Rosene Interiors was hired to assist this young professional in creating a chic, comfortable home in her newly purchased State-Thomas Condo in the Dallas Uptown Area. Turquoise is her favorite color so we started by painting the existing yellow walls a soft gray shade for the background canvas. A large, comfy Vanguard sectional in a gray & white tweedy, low-pile chenille fabric grounds the open living area. 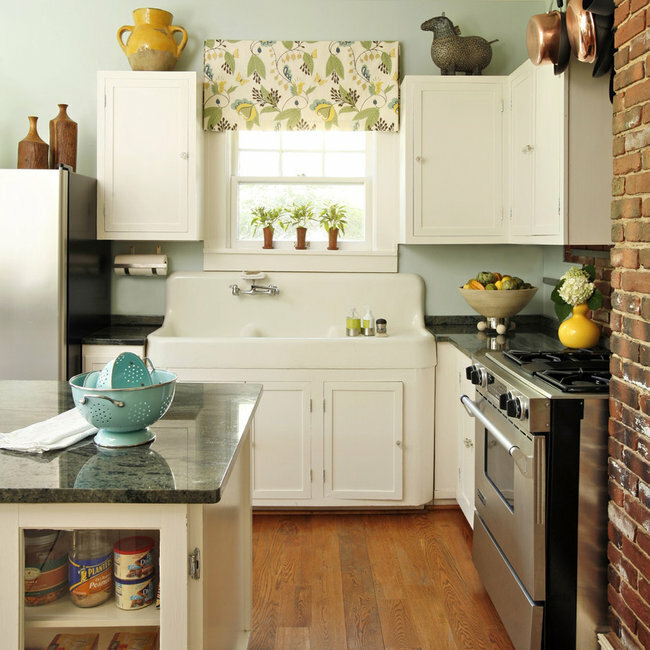 Punches of turquoise, greens and coral fabrics were added to keep things lively and fresh. 10 photos MY OWN REALITY TV SHOW- client called from Miami on Monday asking to decorate his new apartment for him by Saturday. Through email and phone, we communicated and the work was completed. The client was flabergasted when he walked into his completely decorated apartment Friday night with his faithful dog and was right at home ready to sleep and start work in Dallas on Monday! 14 photos Trend Meets Trad- This 1926 home in Ft. Worth's historic Ryan's Place had been updated by the previous owner, after many years of neglect. 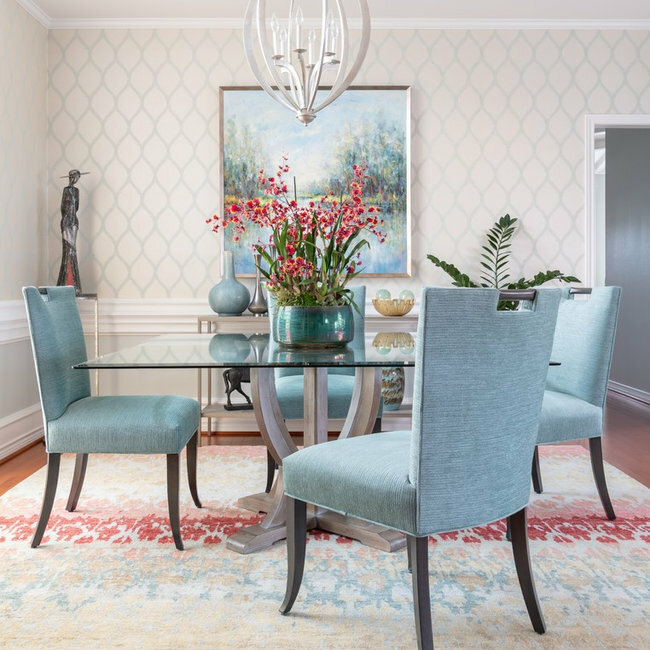 When my client purchased the home, we needed a fresh, new take on the classic. 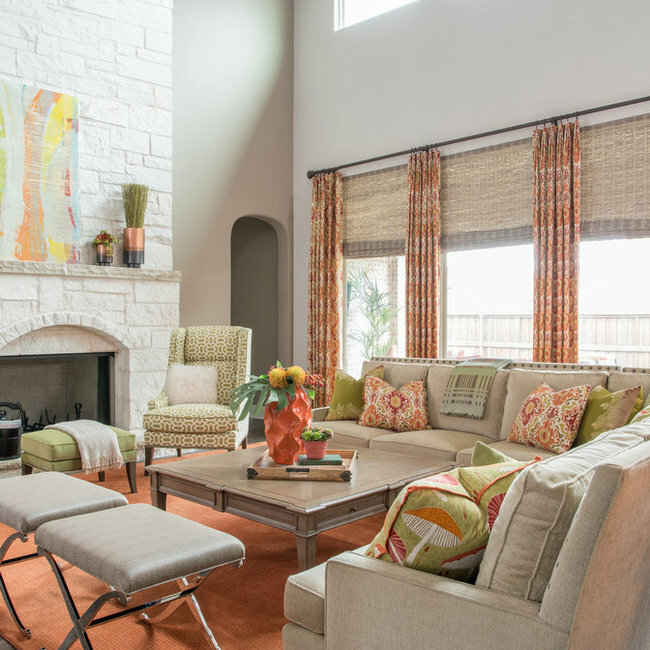 Bold colors, animal patterns and art create a livable retreat for this young family to entertain friends and family!